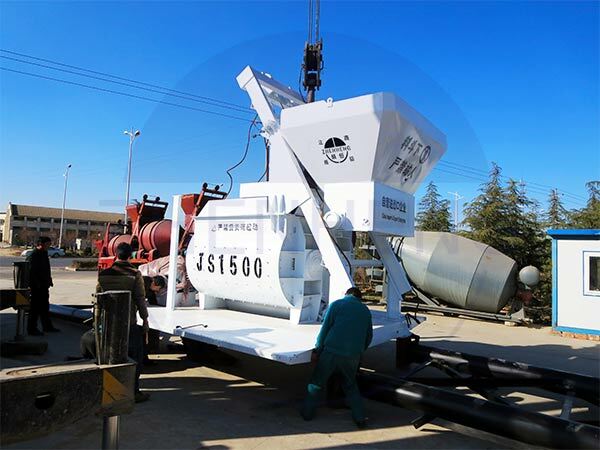 How to Safely Operation JS Concrete Mixer? As the main component of the Concrete Batching Plant station, the safety of the mixer and the long time operation are very important. zhenheng will be popularized in this article. What are the necessary operation points of the mixer? A. The local electrical console must be operated by professional operator, fully checked before starting work and then operated in sequence. a Powered on the machine, the power and fault light on. b Adjust the Digital Time Relay with demand water supply time. When the mixer is running, the flush valve should be closed. c Inching the mixing motor, checking the direction of mixing shaft running is correct or not. d Start the air compressor. e Start the Mixing motor. f Press the hopper up button, with the hopper rises to the discharge position, press the water supply start button, so the water and material enter the mixing drum at the same time. After the hopper discharging is finished, press the hopper down button to reset the hopper. g Material can be discharging after 30s mixing. At that time, turn the unload button until discharging finished, and then close the unload door. h Repeat above from a - g for next circle. a Motor shell, Bracket and Electrical console must be grounded with the ground resistance no more than 4KΩ to ensure the safe operation. c No overhaul with the machine running. Must be power off, hang up the attention card and special protection to prevent personal accidents while do Overhaul. d Strictly prohibited to stand under the hopper or climb the track while the machine running. e No Overloading or Overfeeding to running the mahcine. f Do not always stop while the machine running, if have to stop, immediately open the unload gate, to avoid the restart have problem with long time stop, if necessary, could manual discharge. a, Power off, hang up attention card. b, Release cylinder, take care and ensure no hurt. D. Do not let the sand, stone or other materials into the machine running parts. The bottom of the hopper must been clearning timely. Make sure the hopper gate open and close easy. E. Open the clean valve, start the water pump to clean the inside of mixing drum; and check the mixing arm Screws no loose when the machine stops.